For many, the holiday season is a time of parties, togetherness, gifts and good cheer. But for some, it is a time of loneliness and despair. Recent disasters and senseless violence threaten to overshadow all that is good in our holiday celebrations. Is it best to let grief silence our joy, or can we, in our joy, lighten the load of those who grieve? I say let’s celebrate the good things we have and use our blessings to help those who aren’t as fortunate. I was thinking, after superstorm Sandy hit and shut off the lights of New York, how central that city has become in the American tradition of Christmas and New Year’s celebrations. The parades, the tree lightings, the big New Year’s ball drop that everyone stays awake to watch. I love living in the countryside, but I would love, love, love to spend the holidays in New York one day. As I was thinking that, it occurred to me that we who live in the remotest corners of America can help keep those lights shining by throwing a New York themed New Year’s party and using it to raise funds for victims of Sandy. How to do so? Think of all the things New York has to offer around the holidays and bring a bit of that into your home, invite all your friends, and in the invitation include a call to donations to the Red Cross disaster relief fund. 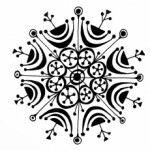 This art piece was created to represent ice skating in Central Park. I took a gilded frame, wrapped it in tin foil and brushed it with black poster paint to add an aged patina. The “ice” was created with old CDs pressed to the wall with reusable wall adhesive (the blue stick). 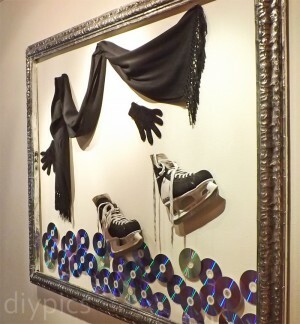 The rest—a scarf, gloves, and ice skates—were mounted with tacks, nails, and double-sided tape. The result is a whimsical, abstract ice-skating display. 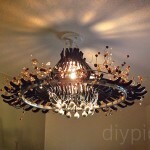 I’ve already posted tutorials on the chandeliers created for this party. One was made with black clothes hangers from Macy’s (how appropriate! ), and the other with wire mesh, printed paper, and silver ornaments. 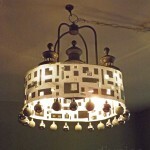 Click on the picture to go to the tutorial for that chandelier. Finally, as I said in the intro, we specified a dress code of black, white, and sparkly for our Holiday in New York party. For more ideas to incorporate into your New York themed party, look at sites on “things to do in New York” and borrow from them. There are shows, restaurants, events and landmarks to help you capture the glamour of New York during the holidays. If you live outside of the United States or would like to donate to disasters in other countries, research the country you’re interested in for “Red Cross donations.” In Brazil you can go here to donate. You may copy and use the donate button above if you wish. Also, to help you create a stunning black and white invitation, you can access my collection of free holiday images by registering for DIY updates in the right sidebar before January 1.